2 remaining instalments of £10 + £20 due. 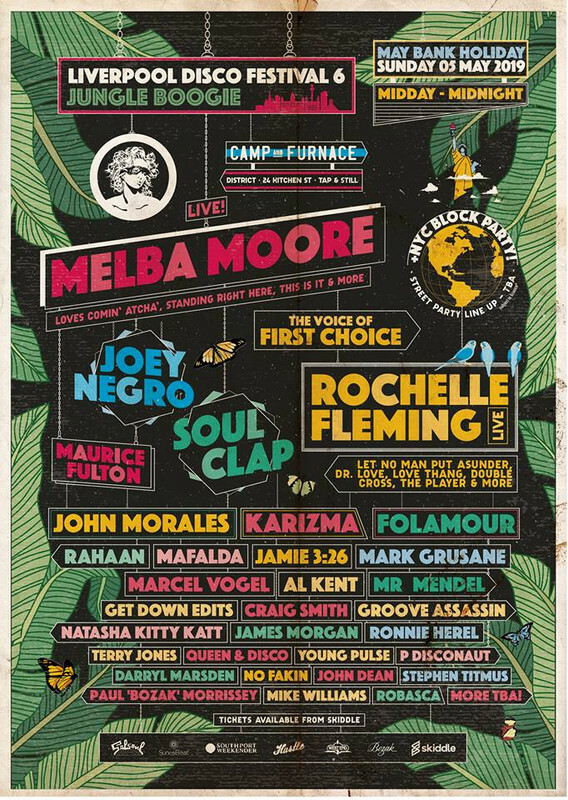 After a fabulous sold out birthday party we return for the 6th Instalment of Liverpool Disco Festival with a 'Jungle Boogie' decor theme throughout plus for the first time an outdoor 'NYC Block Party (Lineup TBA). Performing: Loves Comin’ Atcha’, Standing Right Here, This Is It, You Stepped into my life & More. IMPORTANT NOTE: The main event is on the Bank Holiday Sunday but we will also have our traditional 'Welcome To The Disco' party on Saturday 4th May and the Finale send off Party on Bank Holiday Monday 6th May. Now is the time to lock in your tickets & accommodation free of charge via sites like Booking.com and Airbnb.co.uk. for what will be a busy Bank Holiday Weekend. Brought to you by Hustle , SUNcéBeat, Southport Weekender& in association w/ Salsoul Records & West End Records. (Powered by Bozak 'Audio For The Soul'). Venues: Camp and Furnace, 24 Kitchen Street, District, Love Lane Brewery, Bar & Kitchen@ & More TBA.